Klarman Hall – the College of Arts and Sciences’ light-filled humanities building that opened last semester – was certified LEED Platinum July 29. The U.S. Green Building Council, which certifies LEED (Leadership in Energy and Environmental Design) structures, awarded the university 87 out of 110 points, the highest total Cornell has ever received. “Klarman Hall introduced many new green-building features to our campus, including natural-daylight shafts for the building’s interior, rainwater reclamation systems that will save valuable water resources, and an innovative rooftop photovoltaic power-purchase-agreement model. 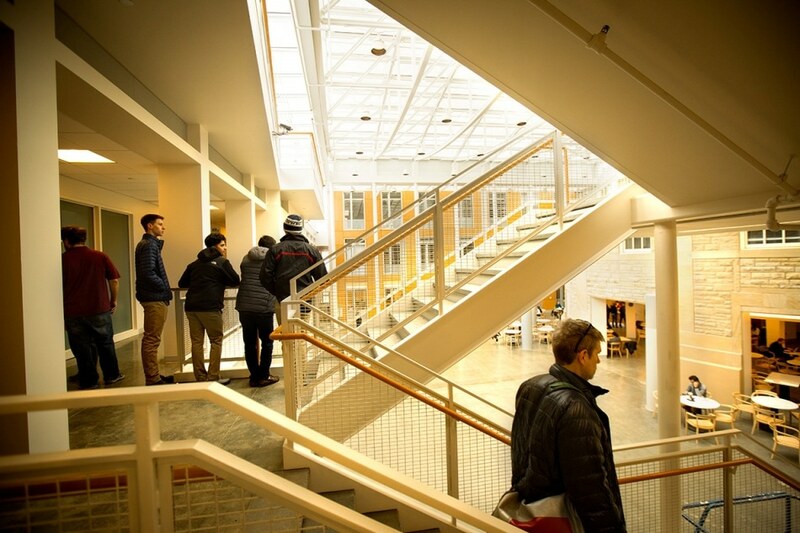 This new arrangement not only provides power to Klarman Hall, but also to the nearby Human Ecology Building – also LEED Platinum certified,” said Matt Kozlowski, the green building program manager in Cornell’s Infrastructure Properties and Planning. Kozlowski said Klarman Hall marks Cornell’s 19th LEED certified campus building or space, and the fourth platinum building on central campus. Glass dominates the building’s façade, and daylight sensors keep the Groos Family Atrium cool in the summer. When light levels become intense, interior shades close, deflecting the light and heat. Kozlowski said ventilation provides cooling at the atrium’s ground level based on the carbon dioxide sensor readings. Occupancy sensors in classrooms and meeting rooms reduce demand for electric lighting. Klarman Hall’s other features include extensive green roof systems to reduce heating and cooling needs; a heat-recovery unit to recapture energy from the return air system in offices; variable-air-volume technology to provide energy-efficient ventilation; and chilled beams to provide energy-efficient heating and cooling to offices. Combined, the Klarman Hall and Human Ecology Building photovoltaic arrays offset more than 22 percent of the total energy used by Klarman Hall, while the rainwater harvesting system reduces potable water usage by approximately 70 percent. Architects Koetter Kim and Associates, Boston – whose principals are Fred Koetter, M.Arch ’66 and Susie Kim ‘72 – designed the building, and Stantec, Butler, Pennsylvania, were the engineers. Welliver Inc., Montour Falls, New York, served as the general contractor.